The production of electricity, from fuel extraction to generation, has growing impacts on both water availability and quality. The new analysis from the Pacific Institute evaluates future water needs for different energy futures and identifies a growing risk of conflicts between electricity production and water availability in the U.S. Intermountain West. The new report also identifies strategies to ensure the long-term sustainable use of both resources. 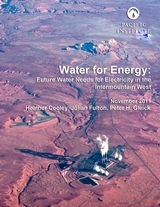 The study, Water for Energy: Future Water Needs for Electricity in the Intermountain West, examines the water requirements for current and projected electricity generation within the Intermountain West, which is the area bound by the Rocky Mountains in the East and the Sierra Nevada and Cascade Mountains in the West. While water and energy conflicts are increasing across the United States, the Intermountain West is of particular interest for this study because it has a growing population (and growing demand for energy and water), a diverse fuel mix for power generation, and existing water constraints and limitations that are expected to worsen. Under current trends, by 2035, water withdrawals and consumption for electricity generation in the region are projected to increase by 2% and 5%, respectively, over 2010 levels – but water availability is already affecting power plant operations and siting in the Intermountain West. And in addition to the water needed for electricity generation, population and economic growth will increase demands for water resources, even as climate change makes the available water supply less reliable. These trends will intensify water resource conflicts throughout the region. The good news is that by expanding energy-efficiency efforts, installing more dry cooling systems, and relying more heavily on renewable energy, such as wind and solar PV, these water requirements can be dramatically reduced. The new analysis shows these alternative strategies can permit increases in electricity production with a significant reduction in total water demands, reducing pressure on scarce and over-allocated water resources. The Pacific Institute report identifies concrete steps to reduce risk in the water-energy nexus: 1) improve data, information, and education on the impact of the energy sector on water resources; (2) accelerate water and energy efficiency improvements; (3) accelerate development and deployment of renewable energy systems; (4) establish cooling technology requirements that limit water use; and (5) promote switching to alternative water sources (such as wastewater and industrial water). Read the summary and conclusions.